The waterproof backpack dry bag duffle bags are constructed of UV proof, abrasion-resistant tarpaulin fabric and it's fully electrically welded together with no needle holes. They are virtually 100% dry bag to protect your beloved travel gears from rain, snow, dirt, dust or sand. Our duffle bag can gulp and hold down a substantial amount of stuff. Its large, open main compartment allows for the most flexible packing options, and the big mouth opening enables full unobstructed access to the bag's interior. The zipper closure provides waterproof protection that outperforms ordinary zippers, so any contact with water save for complete and extended submersion will not penetrate the duffel. When you are riding a bicycle or motorcycle, they will be more a cargo bag than a duffle bag. 1: Unmatched Durability - made with heavy duty water resistant 840D nylon TPU. Polyester mesh backing to keep your gear clean and dry. 2: This waterproof bag's surface is very smooth, just simply wipe,Instantly clean as new, ideal for outdoor activities. 3: This bag included one shoulder strap, it's can be used as handbags, messenger bags, backpacks, and also can be used as motorcycles, bicycles, cars luggage bags according to your needs. 4: EVA MOLDED BOTTOM EVA molded bottom provides a sturdy and waterproof landing pad. 5: Laminated, high-density nylon is nearly impenetrable to nature's assaults. 6: Two easy-to-access mesh pockets keep your valuables safely tucked away. 7: This is where the magic happens. Water stays out. Everything inside stays dry. 8: Comfortable and durable - whether it's strapped to you or the horse. 100% WATERPROOF-our business is waterproof, and our quest is to keep you and your gear dry.No amount of rain, snow, dirt, dust, or sand can penetrate this bag. In fact, it will protect against any conceivable circumstance or even complete submersion! Metallock hardware this hardware can take on smacks and whacks without breaking For 18 months after the date of purchase, we take care of all quality-related issues with a REPLACEMENT. 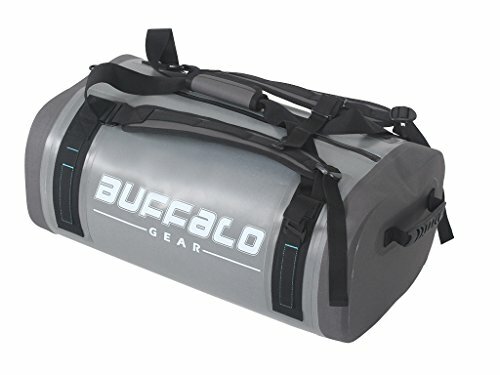 If you have any questions about this product by BUFFALO GEAR, contact us by completing and submitting the form below. If you are looking for a specif part number, please include it with your message.